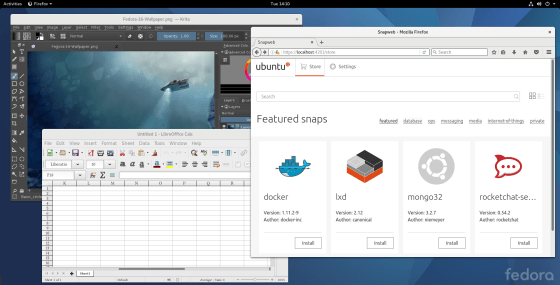 As part as our mission to get snaps running everywhere, we are pleased to announce that support for snaps has now officially landed in Fedora, starting with Fedora 24 and up. Big thanks to Neal Gompa who has been instrumental in landing snapd packages in the Fedora archive! After that, everything is set up to get you started with snaps. When installing a snap for the first time, the “core” snap (which provides base libraries for snaps) is installed as well. Success, it’s a snap indeed! Among other things, snaps make packaging, distribution and updates really easy for developers and automated for users. Which means you will get the latest version of your installed apps directly from upstream, on release day, or even daily if upstream has integrated snap publication into their CI process. 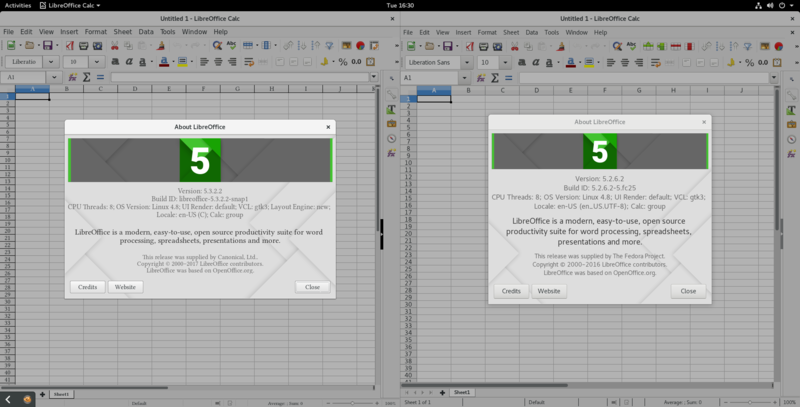 As an example, here is LibreOffice running from the snap (5.3.2.2), next to the one available in a fully upgraded Fedora 25 (5.2.6.2). Snaps rely on an AppArmor backend to ensure their confinement from the rest of the system. Since Fedora doesn’t ship with AppArmor, snaps will run unconfined. Nevertheless, the snapd team is welcoming contributions to a SELinux backend! If you are interested in contributing in this area, get in touch on forum.snapcraft.io. To browse all the available stable snaps in the store, you can visit uappexplorer, use the “snap find” command or install the “snapweb” snap and visit https://localhost:4201 for a local store interface. If you want to snap your software and publish it, you can have a quickstart at tutorials.ubuntu.com and dive-in further with the snapcraft documentation.